You’ve booked your summer vacation for a favorite beach setting, but now is the hard part. It’s time to start thinking about what you need to prepare for the trip, and that is where these tips on What To Pack For A Beach Vacation will come in handy. Not only is it a great checklist, it has a few tips on what you might want to tuck into a bag that wouldn’t immediately come to mind when you think about beaches. Some of these will be the usual items you always think of, and others will be new reminders of what might come in handy that you hadn’t thought about. WATERPROOF SUNSCREEN: No matter what skin tone you have, or how great your tan already is, sunscreen is essential. For protection against not only sunburn but skin cancer later in life slathering on a generous amount of sunscreen from head to toe prior to a beach visit is essential. You’ll find that local swim shops will have higher prices so grab some before you leave home. ALOW VERA GEL: You’re prepared with sunscreen but you always want to pack some aloe just in case. Inevitably there will be a spot or two that ends up with a bit of burn and aloe is a great way to sooth and help heal the burn. It is also great for moisturizing those little guys and gals whose skin might become chapped due to the wind on the water. WATER SHOES: Sandals and flip flops are common beach wear but we find that water shoes are a better choice for kids and adults when there is much walking to do going back and forth from beach to car. Water shoes protect your feet from rocks, sticks, etc. and are also less likely to slip around if your feet are wet from coming out of the water. Fewer accidents and better support is well worth wearing them. EXTRA TOWELS: Your resort, hotel or condo may have towels for you to use but your own beach towel from home will be preferred. Not only are resort towels often not as large, you will want something you don’t have to worry about returning. GEL ICE PACKS: Although you my have a cooler and ice along for the day to keep your beverages and snacks chilled gel ice packs are a great item to keep in your cooler as well. They help with accidents, sooth sunburns and help keep things colder for longer periods of time. EXTRA BAGS FOR WET THINGS: Pack some plastic shopping bags or a “wet bag” to be used for wet towels, t-shirts, shorts and swim suits for those car rides from the beach to where you are staying. JACKETS: Sure it will be hot when you are in the sun but evenings are almost always chilly on the beach. The wind and water will cool the air and you’ll find yourself in need of a light weight jacket or fire on the beach to stay warm. COLLAPSIBLE CHAIRS: The sand is fun to sit on but those collapsible chairs that you can haul in little matching bags are a great investment and easy way to stay comfortable while enjoying the sun. EXTRA SWIMWEAR: You have that one great suit you love to wear but when you are going to the beach you really need at minimum 2 swimsuits. One to wear while the other is drying. HAND SANITIZER & SANITIZING WIPES: There aren’t always bathrooms with soap available so going prepared for anything with sanitizer is always a smart move. LARGE BRIMMED HAT: Nothing shades your face and neck quite like a large brimmed hat. Very important for shade and preventing burn. TRASH BAGS: Whether it is the bits of paper left over from lunch or treasures found on the beach a few trash bags are always handy to have when going to the beach. SUNGLASSES: Grab cheap sunglasses for everyone in the family. Make sure they have UV protection, but don’t spend a lot on these because they are easily lost or broken and you don’t want to feel bad if that happens. WATERPROOF POUCH FOR IMPORTANT DOCUMENTS/EMERGENCY CONTACTS: Grab a waterproof pouch to keep on hand with a list of emergency contact information, a photograph of everyone in your group and information on where you are staying. It’s important to have this on hand should there be an accident or separation between yourself and your kids. 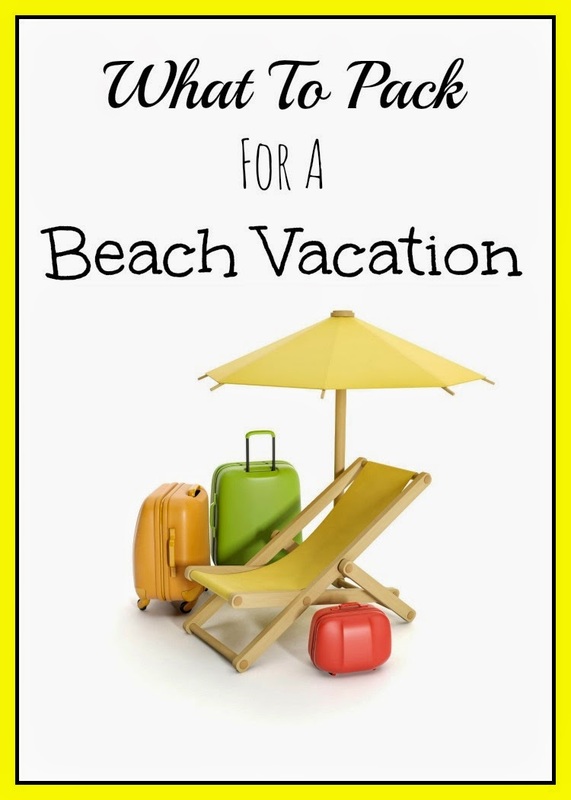 This is just the beginning of what to pack for a beach vacation, but serves a great starting point and checklist to help you stay on top of things when planning and packing. You don’t want to over pack, but you do want to be fully prepared for everything that might come your way. Remember when traveling with children that more is always best.